An upscale and lively dining room awaits you at Fogo de Chão Churrascaria in Scottsdale. The main dining room of this Brazilian steakhouse is almost always busy at dinnertime; it buzzes with motion and noise as people move to and from the market table and the gaucho chefs skitter about offering cuts of freshly grilled meats and side dishes. I call this type of experience 'adventure dining,' where the activity and meal presentation is as entertaining as the appreciation of the meal itself. There are no surprises at Fogo de Chão; the price is fixed for adults, between $34 and $52 (2018) depending on the time of day, half price for children 7 to 12 years old, free for children under 7. Your meal includes the market table (salad bar), meats and side dishes to share. Beverages, desserts, tax, and tip are extra. If you have a couple of glasses of wine and share a dessert, you can expect to spend between $150 and $200 for a couple. Special pricing is offered for those would rather skip the meat and just enjoy the market table. This restaurant typically participates in Arizona Restaurant Week, and the prices are a bit lower at that time. Fogo de Chão (pronounced foh-goh duh shone) is a dining experience. Here's how it works. After you are seated and order any beverages, you are invited to the market table where you will find beautiful fresh vegetables, mixed salads, cheeses, sliced meats, soup and more. The Brazilian black bean dish, feijoada, is offered at the market table. Warning: if you intend to also eat meat during your visit, don't be tempted to fill up here! You can always go back later. After you've settled in and watched the action taking place around you (that's part of the fun) you are ready to give the green light (a disk on your table) that you are ready for meat. At Fogo de Chão there are several varieties of meat served, including some chicken and pork in case you don't want all or any red meat. Half the fun is in trying to remember what you've eaten and which meats you have yet to try. What is that on my plate? Is it top sirloin or filet? 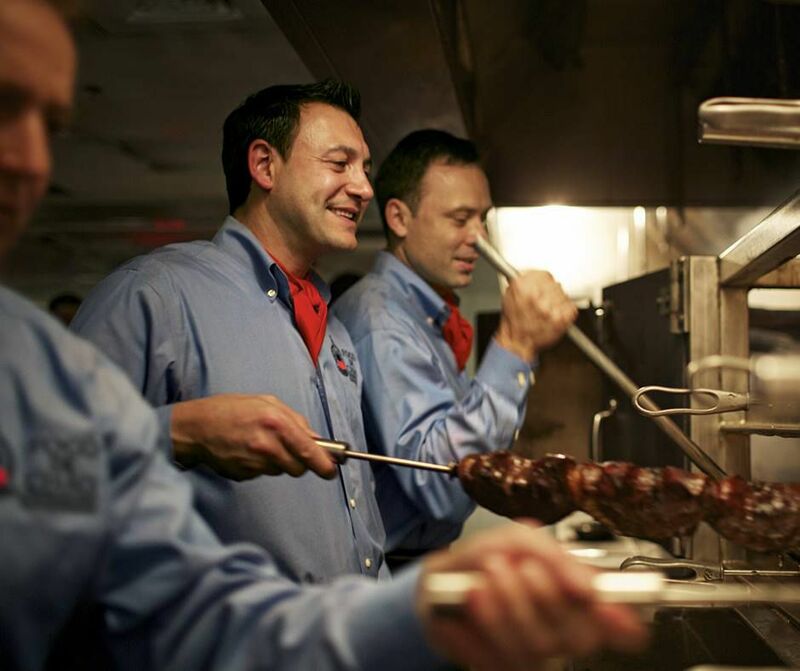 At Fogo de Chão you are not assigned one server; anyone and everyone will take care of you. One of the noticeable differences between Fogo de Chão and other Brazilian restaurants of this type locally is that they don't try to fill you up with the least expensive items fist and hide the filet mignon until you are too full to enjoy it. All the meats are circulating all the time. It's simply up to you to pace yourself and turn your table disk to red when you need a break. There is no time limit on your meal. I like my beef done medium or medium rare (pink to slightly bloody), and most of what is served here comes just that way. If you like your meat well done, just ask and they will prepare it to your desired temperature. I definitely recommend Fogo de Chão, especially if you want a bit of excitement while you dine. It is a perfect place for a first date because just the act of dining here sparks conversation. No worries about having to agree on what to share. This restaurant is not my first choice, however, if you want a quiet, romantic dinner where the servers leave you alone to gaze into each other's eyes. Special occasions, relatives visiting, a casual business dinner — yes, it works. Between the market table and the variety of meats there is sure to be something that everyone in your party enjoys. If you order wine with your meal, the wine list at Fogo de Chão is one of the best in the Valley. Fogo de Chão is a bit expensive for a casual lunch if you aren't on an expense account, but who says you can't have your main meal in the middle of the day if you have the time to spend? Fogo de Chão is open for dinner seven days per week, and offers lunch Monday through Friday until 2 p.m. and has brunch hours on Sunday. On Saturdays, the Brazilian feast begins at 2 p.m.
Disclaimer: As is common in the travel industry, the writer was provided with complimentary services for review purposes. While it has not influenced this review, TripSavvy believes in full disclosure of all potential conflicts of interest.